Aamir Khan Birthday Special: 10 Interesting Things To Know About Mr Perfectionist! Aamir Khan, known as ‘Mr.Perfectionist’ as we all know is one among the celebrated big Khans of Bollywood. The Box Office King has always left us with no choice but to appreciate in awe of his hard work, élan, and sheer skills. He is such a brilliant actor and a personality that you would never get tired of reading about him. Did you know Aamir Khan loves playing board games and one of them he is obsessed with is — Settlers Of Catan? As a child actor, Aamir Khan appeared in two minor roles. At the age of 8, he appeared in a highly popular song in the Nasir Hussain-directed film ‘Yaadon Ki Baaraat’ (1973). The film turned out to be the first Bollywood masala film. The following year, he portrayed the younger version of Mahendra Sandhu’s character in his father’s production ‘Madhosh’. Very few know that Aamir Khan’s participation in sports was always his first priority during his growing years and was also the state tennis champion from Maharashtra. He was more into sports than studies. He belongs from a family of freedom fighters. Yes, his great grand uncle was Maulana Azad. 6. why Aamir Khan doesn’t attend award shows? This question has always been on everyone’s mind- “Why Aamir is against the award shows?” Well, the truth has he always loved award shows but his point of view changed in 1996 when he lost the Best Actor award for “Rangeela” to SRK for “Dilwale Dulhania Le Jayenge that year”. While this whole episode didn’t go down well with Aamir, he even thought that the organisers were always biased towards SRK. Since then, the superstar has avoided attending awards shows. We bet you might not know this. The actor had a hair-breadth escape from death on the sets of his film ‘Ghulam’. Aamir was about to meet with a train accident in the famous ‘10:10 Ki Daud’ scene. Just like the spine-chilling scene in the film, while shooting for the scene in real, the ‘Dangal’ star jumped off the rails only when he was away from the train by 1.3 seconds. He escaped a huge accident. We all know Aamir Khan has always set new records at the Box Office. Actor’s huge fan base turns up in bringing his films to 100 crore club. His highest grossing films are ‘Dangal’, ‘PK’, ‘Dhoom’ 3, ‘3 Idiots’, ‘Ghajini’ and recently, ‘Secret Superstar’. Secret Superstar has already made it Bollywood’s global box office champion among movies released in 2017, courtesy China collection. He believes in working secretly for a good cause. He has donated some big amounts without flaunting it to the world. In 2013, the actor donated Rs. 25 lakhs to the Uttarakhand flood victims and in 2015, he donated Rs. 11 lakh to the Chief Minister Devendra Fadnavis’ rural water conservation programme. He is also being contributing in some other way through the initiative of ‘Satyamev Jayate’. Aamir Khan made his Instagram debut a day before his 53rd birthday, on 13th March. Without a post he scores over 221K followers and counting more. Wondering what is his profile pic!? Well it’s his latest movie shot Thugs Of Hindostan. The news of Aamir making his debut on Instagram has spread like wildfire and #AamirKhan #OnInstagram has been trending on Twitter. 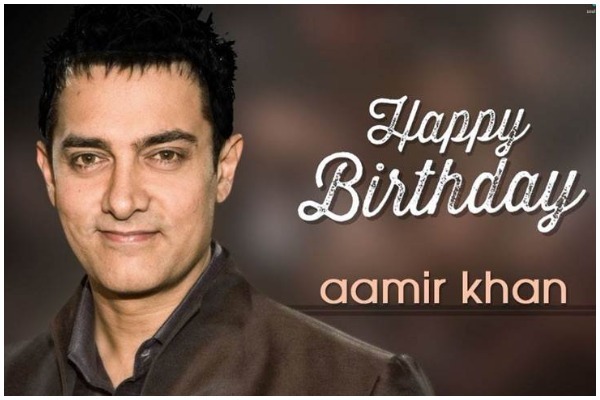 Eventznu wishes Aamir Khan aka Mr. Perfectionist A Very Happy Birthday! Next : Dear Bollywood, Stop Producing Films That Glorify Stalking As ‘Cool’ and ‘Romantic’!